It's all bigger: Large 3-1/2 inch boost tubes, Thicker core with 27 Percent more flow volume. Superior aluminum end tank design. Includes Monster-Ram intake and boost tubes. Increases air density for higher continuous power. Superior to stock, everything about Banks Techni-Cooler Intercooler system is bigger. It includes mandrel-bent 3.5" high-flow boost tubes ... large, high-efficiency all-aluminum end tanks ... a wide-open inlet and outlet ... a 20% thicker core area with a 27% improvement in volume ... and a colossal super-flow Monster-Ram intake manifold . Increases air density for higher continuous power. This is the first measure of intercooler performance. If an aftermarket product can't deliver a boost increase over the stock unit, there's no point in even opening the box. All the units tested better than stock with Banks the clear winner... So far, so good. This is the reason for an intercooler in the first place. Boosted air that's colder packs more oxygen. Cooler intake air and more oxygen lowers EGT's, improves economy and unlocks your fuel's power making ability. Measuring air density gain over stock is the most vital aspect of intercooler performance. This is where the Banks patented density measurement comes into play. Banks and AFE are both in the game but BD cooled so poorly that it actually lost density... WRONG! If an intercooler blocks your engine's radiator from the incoming airflow it needs, the resulting high temps cause the ECU to cut back fuel, leaving you with de-rated power and heat-related breakdowns. The point is to improve your vehicles's performance, not cripple it. Spearco and AFE's bar and plate cores block so much air to your radiator that it's like putting cardboard in front of it. That's a fail for both. The final rating sums the three results above with a weighing of 20% for boost gain, 60% for density improvement and 20% for air flow-through to the radiator. 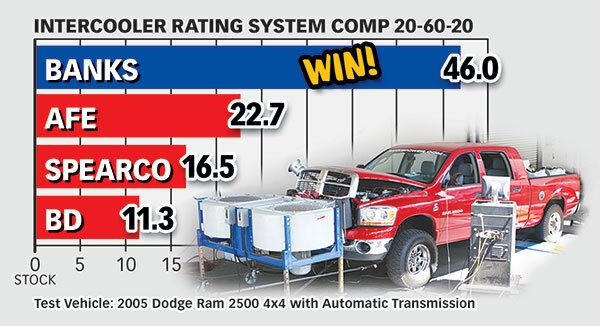 When you add up the results of these tests it's easy to see why Banks comes out way ahead: the Banks Techni-Cooler will produce quicker throttle response, higher continuous power at any exhaust gas temperature, better economy and a more reliable rig. All benefits and no compromises.